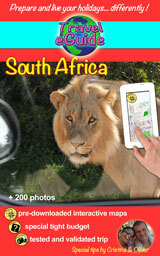 So… Welcome to South Africa, home of the « big 5 » and Cradle of Humankind! We have rented a car and made an itinerary of more than 3000 km across the country. Pretoria is the administrative capital of South Africa, called « the City of Jacarandas » in reference to the hundreds of thousands of trees that bloom during austral spring and give a purple color to the city. As you can see in the photo, the spectacle is beautiful! The Transkei is located in the eastern part of the country, bordered on the east by the Indian Ocean, to the north by Umtamvuna River, south by the Great Kei River and to the west by the Drakensberg Mountains and Lesotho. The largest city is Umtata (Mthatha) and you are going through… as the road goes. These are the traditional dwellings of the Xhosa people in South Africa, after many of them, coming from the Great Lakes region, gradually migrated towards the south while displacing the original dwellers of the Khoisan hunters. Seeing an elephant walking just near your car… or being followed by a lion. Do you think that exotic tourism, safari, wide spaces and adventure are not for you? We have been traveling all around the world since our studenthood and have visited more than 45 countries so far. We love to find convenient and affordable travel solutions in order to maximize our touristic budget and discover hidden treasures during the journey, just like you! We are happy to offer you a FREE UDEMY COURSE included with our tips & tricks to travel free without ruining yourself. In this innovative Travel eGuide, a vitaminized additive to other tourist guides, we will share with you our passion for travel and our passion for South Africa, a young and powerful country that will astonish you. Discover the land of the “big five”, amazing sceneries, the cradle of Humanity and dozens of other attractive spots. So, if you do not know where to spend the next holidays, why not pay a visit for a few days to this amazing country? All its treasures are waiting for you! Afrique du Sud: un très beau pays à découvrir! Découvrez l’Afrique du Sud, un pays aux multiples facettes qui vaut le voyage ! Découvrez la faune des parcs nationaux : zèbres, lions, antilopes, kudus, phacochères, autruches, buffles, éléphants, des centaines d’oiseaux, etc. Mais aussi des paysages superbes, des musées, parcs d’attraction et plein d’autres choses à découvrir! Une nature époustouflante à découvrir et à admirer.